Larry Beckelman and his wife, both SAGA members, run a 40-acre ranch near Arivaca, Arizona. I visited them in June, 2001. After a pleasant hour drive from Tucson, the road turned from pavement to well-compacted dirt. Lined with a healthy assortment of desert growth, the catclaw, mesquite, and desert grasses gave way to a manicured entrance way surrounded by a beautiful, meandering adobe, hip-high wall. 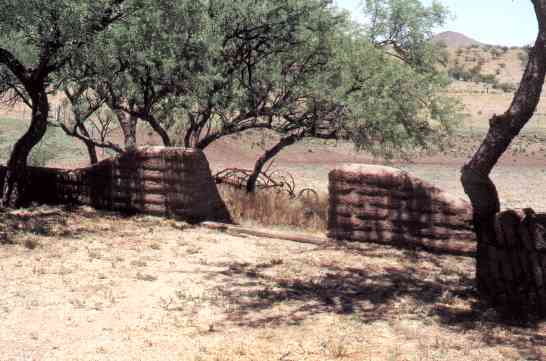 These adobe walls, built by Larry and his wife, cover much of the area close to the main house. Here they cradle a shady area ajacent to the main house. You can see a farm plow framed by hand-made adobe walls in this particularly attractive shot. Soon Larry came to greet me. 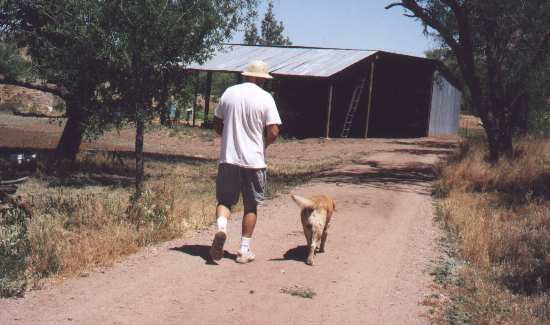 Larry (always clothed in his trusty hat), his dog and I wasted no time in finding his gourd barn. Larry made no bones about being an avid recycler. Like most private ranchers in Arizona, Larry creates his living by doing what he can, when he can. 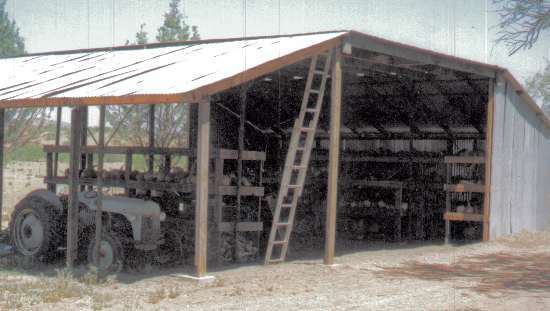 Ranch owners have to be quick to show quite a bit of ingenuity and resourcefulness to keep their enterprise going. Recycling building materials is an expertise of Larry's. This gourd barn is made from recycled materials. Larry and his family built their entire house by hand, too. Not bad! 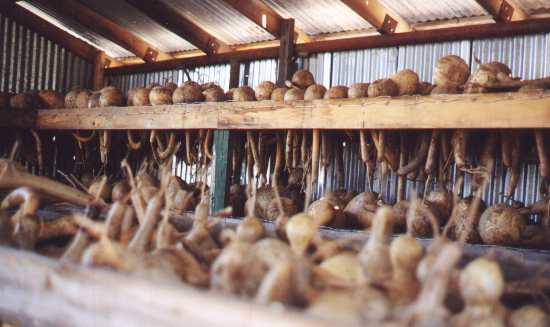 The entire half of the gourd barn is built with drying racks for the beloved gourds. 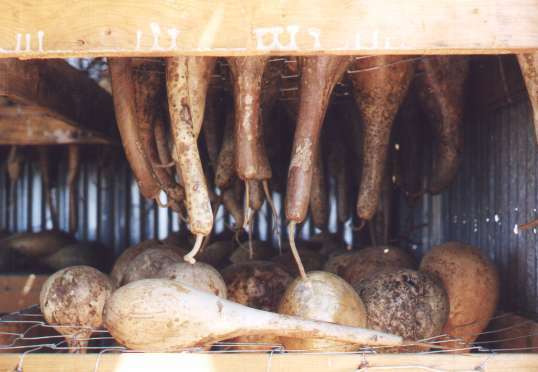 These are last year's gourds, already dried.